Last post Mon, Mar 18 2019 by Beat Kaufmann, 12 replies. Here is an arrangement I did of JS Bach's Organ Chorale (BWV 727) for strings and organ. I am particularly interested on feedback on the mix as I mix exclusively on headphones (ATH-M50x). Any tips on how to mix on headphones from experienced members would be great. At the moment I use TB Morphit to correct my headphones and MagicAB for checking against references. I am also trying iZotope Tonal Balance Control and ISOL8 to get tonal balance right. For those interested, I used all VSL instruments: VSL Chamber Strings Full, VSL Synchron-ized Appassionata Strings and VSL SE Organ, with VIR MIR Pro 24 (Vienna ORF Grossersendesaal). Other plugins include Waves SSL and Relab's VSR S24. Are you maintaining a single tempo throughout the entire piece because it does sound a bit mechanical to my ears. Even if a piece is written in one constant tempo players will speed up and slow down slightly here and there. The key word here being "slightly" so not too much tempo variation to the point it draws attetniont to itself. They'll especially slow down a little bit at the end of phrases. Also are you using a high pass filter on this? It sounds kind of thin to me for some reason like the upper mids are coming out too much but I was listening in my car while driving so maybe it was my listening environment. Thanks for the feedback. I am starting out so I appreciate the honesty. I have a tempo map which varies the tempo constantly but I think what you are saying is that it is not dynamic enough particularly within the phrases. I will definitely take that on board. Yes, I was worried the upper mids seem too much. 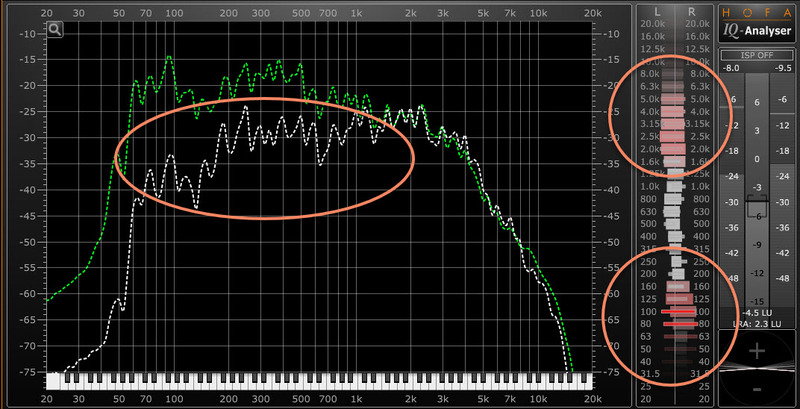 I tried a bit of corrective EQ but I think I need something more drastic in the upper mids. Searching on the forum, I see a few other people mention the need to do this. I have a high pass filter but at soemthing like 30Hz. I think it is the upper mids are out of balance as you say. I am particularly interested on feedback on the mix as I mix exclusively on headphones (ATH-M50x). Any tips on how to mix on headphones from experienced members would be great. The sound of your mix is ​​not very pleasant via my monitoring system. Presumably, you have used quite a bit of sound effects, especially when I read that you also tried Tonal Balance from iZotope etc. The first tip I can give you: Remove all sound effects (or switch them off)! No EQ, no filter, simply nothing. VSL has recorded all instruments at the highest level and tuned the sounds with the best monitors and devices. The beginner usually breaks these great sounds. He often totally deforms these sounds with EQs and other sound designing tools. He thinks and believes to "filter out" resonances but often that are either important overtones of the certain instrument or those "resonances" come from bad monitors, the listening situation, ... etc. So turn off all your sound effects and hear how real your strings sound without anything beside a bit of reverb. Later you may be able to cut off the unnecessary low frequencies (LowCut) or raise the high frequencies a bit with a hishelf filter for more presence or lower the hishelf filter a bit for a slightly more distant play. More I woud not do while you are collecting first experiences. Beat, thank for taking the time to give me the benefit of your experience. I am going to strip out all the effect like you suggested (as well taking on some other feedback on dynamics and tempo). I've got some good tiups to work with. Here's a new reworked version (version 2) where I have taken on board suggestions for more dynamics, more tempo variation, changes to the organ part and less FX. Interested in feedback on what worked and what might still need attention. I used all VSL instruments: VSL Chamber Strings Full, VSL Synchron-ized Appassionata Strings and VSL SE Organ, with VIR MIR Pro 24 (Vienna ORF Grossersendesaal). the second version sounds better. Still, I would replace the Appasionata Strings with Solo Strings. I think this will suit the piece better and give the chamber strings more life. Also a little more reverb may help to connect the notes better. Thanks everyone for feedback. It's been a useful learning exercise. Here's a new version 3 with VSL SE Solo Strings stacked on the VSL Chamber Strings I (Full). I made a few other changes. Interested in any further comments. I would like to comment on the use of headphones for mixing. When I began studying about mixing and mastering, I always came across comments from almost all the studio professionals; and they said "never, never, never use headphones for mixing or mastering !" Now, I am old school ( I am 63) and I did understand their reasoning behind their almost ranting about this. But maybe todays headphones are of much better quaility that 30 or even 20 years ago. It is my opinion though that their opinion is still correct. Apparently, our ears have a hard time determining the tone (or timbre) of particular instruments, when the source of the sound is so close to our ears, as in the case of the headphones. Once again, most of those professionals said they use headphones exclusively for checking the balance of the instruments (left, right or center in the stereo field) but always relied on the studio monitors for tone and which instruments were too loud or too soft in the mix. To make a long story short (maybe too late already) I usually wind up mixing 119 or so tracks with the way I mix. That sounds like alot I know but every one has different ways of getting the results. It drives me a little crazy at times but I have the luxury of time on my hands. I am certainly not an expert on this but if you have any questions, I would love to chat about it. Earlier, I recommended that you should remove all effects from your strings, because the sound sounded quite far from "natural". Example 3 now may sound different (I did not compare again with 1) but still pretty far from "natural". With the VSL samples you have a great sounding library. People of VSL took great pains to record the samples, edit and publish them. So you get a great sound without doing anything. What is/was your mixing goal? I do not know what you wanted to achieve with all the effect you used for your mix. A more pleasant sound? Green means original - VSL strings / White is your BWV 727. Incidentally, you also see that you probably used a stereo widener tool. Especially in the lowest frequencies and from 2kHz above "stereo has become a bit too much" or you used a reverb that makes a bit too much stereo here. I can only recommend again: Try to use less effects (until you know them better), check your listening situation, use reference sounds and try to hear your own mixes more often on other systems (car, hi-fi, etc.). Sorry I was very direct. That might hurt a little. But keep in mind: I would not have taken all the effort if I did not really want to help you. I hope you can see that positively. Thanks for your honest constructive feedback. The sample WAV file you did showed remarkably what you mean by the "tone" not being good. I am going to go back to just the samples and MIR PRO and see what I can do with careful programming. I will also, as you suggest, try using the car and my hifi system to listen to my mixes to see how the tone sounds in different listening contexts. The example shows how important it is to always work with references. Our ears (brain) get used to new conditions within a short time. When you are working on a mix for a long time, you usually do not realize that you are completely wrong with the sound. In this situation, only a comparison with a good reference helps. When you work with MIR: Keep in mind that there are a lot of parameters that can affect the sound: venue selection, microphone method, microphone positions, number of microphones, EQ, amount of "wet" ... even though the tool makes you believe it is customer-friendly in everything (which it is), you can do a lot wrong as well. The recipe also applies in this case: "Less is more." - means: If you do not know exactly what you do, do as little as possible, ... Then also: Again and again compare with a reference.